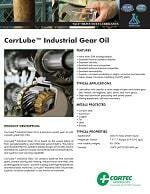 Description: CorrLube® Industrial Gear oil is a premium quality gear oil with viscosity grade ISO 220. Package: 5 gallon (19 liter) pails, 55 gallon (28 liter) drums, liquid totes and bulk. FEATURED IN: Corrlube Featured in Canmaker Magazine!